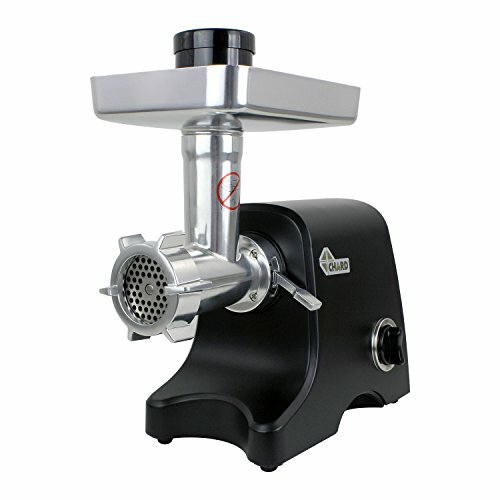 The CHARD #12 Heavy Duty Electric Grinder lets you make your own variety of burgers, brats and sausages. The 500 Watt motor, large hopper and food pusher allow you to grind or stuff generous portions of meat in a short amount of time, quickly and efficiently. The reverse auger function helps to prevent jamming and ensures continuous use. The stainless-steel cutting blade and sintered steel cutting plates can process up to 6 pounds of meat or game per minute. All grinder accessories conveniently nest inside the food pusher. The hopper and grinder head assembly are removable for easy clean up. Includes two sausage stuffing tubes and one stuffing plate attachments. Also features a built-in cord storage area and a thermal safety reset button that provides overload protection and extends the life of the grinder. CHARD Products put you in control with a little help from the right tools. From meat processing, to outdoor cooking, to simple food preparation, we help you Make It Yours. If you have any questions about this product by Chard, contact us by completing and submitting the form below. If you are looking for a specif part number, please include it with your message.